Frank Sinatra had his Harry James. I had my Tom Dunn. Tom Dunn did that for me. He was not only a very special man to so many people, he made one of my greatest dreams come true: the publication of my first book. My parents, who educated me, and Tom Dunn are the reasons you are even looking at this website. I never met him, although I still have his always-charming correspondence ~ hand-written in a usually illegible script on post cards, sometimes a typed note, occasionally a letter on his own letterhead. Although highly private, famous among his following for keeping “a low profile,” Tom was no recluse, and his following extended around the globe. No man I ever heard of was loved by so many yet seen by so few. This reclusive and elusive lightning that so many had tried for so long to catch in a bottle was actually very active in some circles, particularly the Adirondack Mountain Club and the New York-New Jersey Trail Conference. 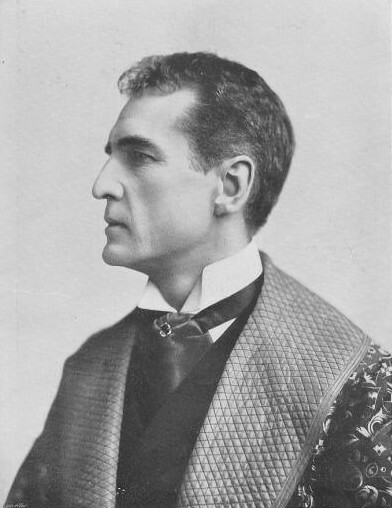 He had friends but, like William Gillette, he kept them few and close. And, he had many interests. Although described as slight of build, he was a great outdoors man, enjoying hiking, mountain climbing, hunting, cross-country skiing, and gardening. Indoors, he enjoyed photography and reading. Quiet, cerebral, and introspective, he nevertheless impressed all who knew him with his self-effacing, unpretentious humility, and his shyness. He was a sweet man, a wonderful man, ultimately generous and loving. He grew up in the home he grew old in, at 20-37 120th Street, College Point, New York, on the northwestern corner of Long Island. A graduate of Flushing High School, he joined the U.S. Army Reserve in 1957, attended the Army’s Engineer School in Fort Belvoir, Virginia, and reached the reached the rank of Specialist 5. Discharge in 1964, he graduated with a Bachelor of Arts Degree in 1969 from the the Washington Square College of Arts and Sciences at the New York University. Then, like his father before him, he went to work for the Metropolitan Life Insurance Company, where he became the human resources manager before his early retirement in 1991, at age 54. The office was moving to New Jersey, which he didn’t want to do; but, his parents were aged and ill, and he cared for them in their declining years. Some people belong to an organization and are content with just paying their dues and carrying a membership card. Tom Dunn was not one of them. There have been few people who have done as much for the NYNJTC with little acclaim, preferring to quietly work “down in the trenches”, where it mattered. He was always looking for ways to enlist hikers into the ranks of maintainers. If you were new and showed up on one of his scheduled ADK hikes, he'd be sure to get to know you. 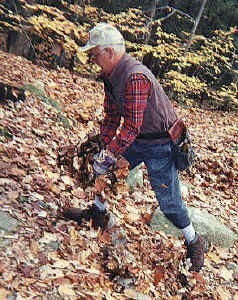 He'd be sure you enjoyed your hike and tell you about some of the other great places to see in Harriman. His enthusiasm was contagious and before you knew it, you were planning to join him on some project. You'd probably receive free gloves to take home with you, maybe even a pair of pruning shears. I remember Tom buying “baseball” type caps from a vendor down in Atlantic City and then paying a seamstress to sew NYNJTC patches on them, rewards for a job well done. And refreshments? How about cream pies, pastries, soft drinks, even an occasional cold beer? One never knew what would come out of that cooler. Always extolling the virtues of membership in the NYNJTC, he gave a gift membership to at least one hiker so he could legally become a trail maintainer. His license plate read “NYNJTC” and you could find his car in Harriman two or three times a week. 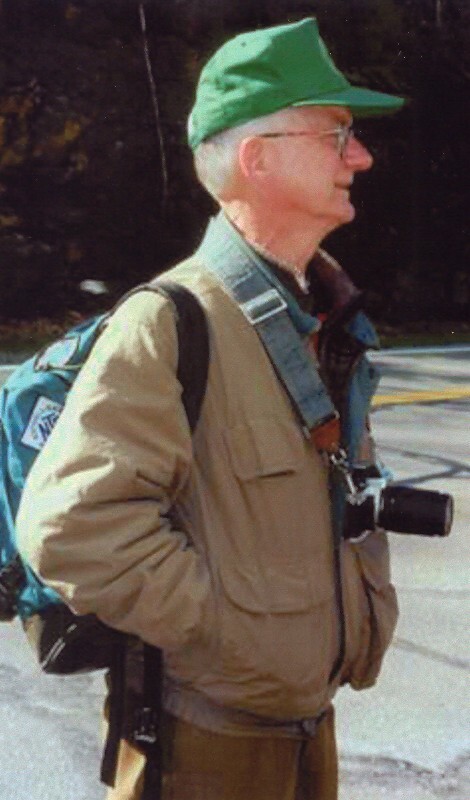 He led countless hikes for the ADK in Harriman over many decades. Probably no one knew the park better and certainly no one was as creative in inventing new routes and in having such a great time doing it. He'd pepper the Outings Schedule with interesting hikes: a “Six Star Jaunt” climbed five mountains to rack up the starred viewpoints on the Trail Conference map. That worked so well he upped the ante with a “Thirteen Star Day”. His “Bee-Line Hike” went as straight as he could make it from Seven Lakes Drive to the Wildcat Bridge using the TMI, WD, WC, RD and Triangle trails, picking up four mountains along the way. Sure enough, next schedule offered “Bee-Line Hike 2". Then there was his Revolutionary War Trails series: three hikes re-tracing the military maneuvers in 1777 and 1779. His signature event was the Annual White-Bar Trail Maintenance Picnic. Tom was the trail's official maintainer but, a little bit of Tom Sawyer here, he made sure he never worked alone by supplying tools, gloves and always a surprise desert (and a bit upscale from Oreos too!). Long before the days of digital cameras, scanners and e-mail, Tom took a group snapshot of every hike he led and mailed a print to each participant ~ usually within a week! Yet, it was not for his involvement with the NYNJTC that Tom Dunn was known and loved around the world. Tom was an international icon because he was perhaps the most prominent man in the world of pipe smoking. This was due to his creation in 1964 of the Universal Coterie of Pipe Smokers (TUCOPS, logo at right) to serve as a club for pipe smokers. Along with membership came a pin and a membership card, but membership standards were hardly exacting. All someone had to do was write to Tom and ask to be put on the mailing list, and he, she or it became an instant member of the Coterie and suddenly enveloped in a highly literate, sophisticated and erudite society. It was also about as informal as a club can get: “There are no dues, no obligations, no meetings, no charter, and none of the usual organizational sets,” Tom told us. It was simply an informal club devoted solely to the mutual enjoyment of pipe smoking. “Meetings” were nothing more than a few club members getting together for dinner, drinks, and a few puffs, if they happened to be in the same hemisphere on the same day. Most of them were doing that already, of course, but without a club affiliation to make it look respectable. His communication to the Coterie came through his equally informal publication, The Pipe Smoker’s Ephemeris (TPSE). Described by Sherlockian Peter Blau as “a print version of an electronic bulletin-board,” and by a GrayFoxOnLine correspondent as “Pipes and Tobaccos mag on steroids,” it was the longest running journal devoted to pipe smoking and related matters in existence, and may well have been the longest-running special-interest magazine ever. Pipe smokers around the world, who otherwise would have never met, discovered each other and formed life-long friendships through its pages. 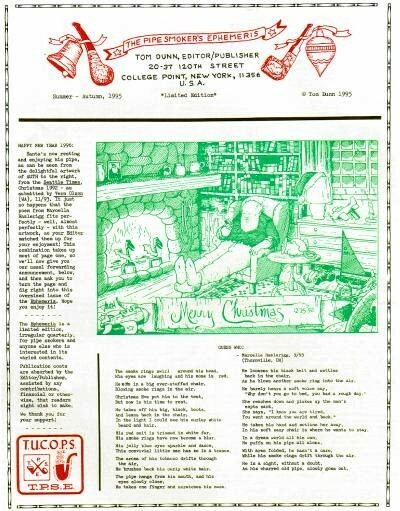 The TPSE was a compendium of articles, photographs and other miscellany, correspondence and commentary, on pipes, tobacco, books, poems, stories, comic strips, cartoons, old ads, antiques, various pipe-related characters, a selection of members' collecting and other interests along with their addresses. It was filled with interesting illustrations about pipes, tobacco, cigars, smoking, and anything else that interested members of the Coterie. Devoted to pipe smoking, the TPSE obviously contained items on famous pipe smokers, and any photo, cartoon, or newsy item related to famous pipe smokers might turn up in its pages: Bing Crosby sheet music, photos of Walter Cronkite or Mark Twain or William Conrad or Albert Einstein or Gerald Ford or Greta Garbo or Ernest Hemingway or Andrew Jackson or General MacArthur or Fred MacMurray or Edward G. Robinson and even Queen Victoria. Obviously, it contained much in the way of information, photographs and cartoons of the most famous pipe smoker of them all, Sherlock Holmes. It thus appealed to many Sherlockians, which was what drew me to it. At least ten of the more than a hundred pages often contained Sherlockiana, with Coterians engaging in S’ian commentary, debate, revelation and pure sharing of the fun. Along the way, Tom published two bound editions of past issues of the TPSE. Clothbound, with full index and more than 500 pages of back issues, they sold for $50. Book I covered 1965 through 1979. A few months after Tom’s death, they were up for auction on Ebay and on sale from second-hand book dealers at prices from $500 on up. Mostly up. And, he issued what he called his TUCOPS Collectors Directory (A Selection of Members’ Collecting and Other Interests). The paper-bound Ehemeris was stapled by the publisher, usually containing more than 100 pages, and always neat, clean, and crisply printed. Everything about it, from the contents to the packaging, was quaint and charming. It warmed your heart to read it. And we did! In addition to monetary contributions, readers sent in pipes (he received hundreds of them), tobacco tins and tobaccos, tampers, cards, photographs, and any other form of miscellany his readers could think of. Some of us, at least once, outlandishly illustrated the envelopes in which we mailed our offerings to him, like the one pictured at right. I sent him money on occasion. Mostly I sent him cartoons, notes, and articles. Particularly articles. I began receiving the Ephemeris in the early 1990s, and contributed right away. When you are a writer, and you think you’re good, and you wake up in the morning thinking of nothing but writing, you want to be read. Following publication of my article on Martin Luther’s impact on the English Bible in 1983, I had nothing published for many years, due largely to the fact that I was researching the rewriting of ancient Egyptian history for what was to be my first book, and I did not try my hand at magazine articles again. After weeks of searching for his quarry, Heffer reported back, “I can’t believe it. Everybody knows him, everybody likes him, but nobody has seen him. I’ve met hundreds of people who would like nothing more than to meet him, but no one has. Oh, one elderly woman recalled him mowing her lawn when he was 12 years old, and then smoking it when he was 18. Every now and then someone will report seeing him at a shopping mall in Oklahoma or a carnival in Detroit. It was rumored that he was captured by a UFO. Some said he had married a waitress in Louisiana. “This began a new line of inquiry. I reasoned that a man who keeps such a low profile must be hiding from something. Was he running from the law? An ex-wife? Was he in a witness protection program? Or was he simply ugly? Hugh Heffer (Chicago, Illinois) appears to be trying to locate your editor for some purpose known only to Mr. Heffer. Perhaps he wishes your editor to pose for his centerfold. Or, perhaps, he wishes to swap a bunny for some pipe tobacco. Intriguing, don’t you think? Perhaps some of you Coterians may have a suggestion for Mr. Heffer on how to find your editor. If so, we will print them in the next issue. And on it goes. Heffer, of course, deduces that, if his ad has reached Tom Dunn at Dunn’s home address, then he might find the elusive editor and publisher there as well, and he does. The subsequent interview, which delighted Tom and appeared in the Summer 1994/Spring 1995 Ephemeris, received quite a lot of responses from readers. Regarding the never-seen Thomas Allan Dunn, Mr. Mendez added, “This elusive and easy-going editor of the eclectic Ephemeris effectually emerges from the entrevue eloquently embellished as an embodiment of eccentric and energetic enterprise. I think. I’m sure Tom was honored by the comparison. You do not let a letter like that go unanswered. We were going to seize this opportunity to wish you a Happy New Millennium because it’s such a rare opportunity, but we felt sure that there would be those who would “get technical” on us and remind us that ~ in fact ~ the New Millennium doesn’t begin until January 1, 2001. On second thought, we’re going to say it anyway: Happy New Millennium! So there! In 1996 I sent him my three-part series, “Sherlock Holmes and the 21st Century,” which was an overview of the entire Holmes phenomenon and a look at his place in this oncoming technological age (See Sherlock Holmes link on this website). Many readers enjoyed this, and years later I still receive requests for copies of it. But, more than that, I discovered William Gillette (right), and went on to send Tom a seven-part series on Gillette. This, too, was well-received by the readers and, in researching it I took the photographs that ended up in a one-hour slide program that has become a major hit in the Sherlockian world. When the program was booked to premier in the 1998 Sherlock Holmes/William Gillette Festival in Tryon, North Carolina, festival founder Jerry Soderquist advertised me as the author of a “book” on Gillette. I reminded Jerry that I had not written a book, only a magazine series. Ben Rapaport, who knew Tom Dunn personally, eulogized him in the pages of the Spring 2006 issue of Pipes & Tobacco Magazine. Nothing is more revealing of Tom’s international significance than the fact that portions of this article were quoted in periodicals, newsletters and websites around the world. One of Tom’s charming idiosyncracies was regarding computers. He did not have one until the end of the 1990s. The TPSE was put together entirely by hand, cutting and pasting the parts on each of the more than one hundred pages each issue contained. He had no email address to which we could write (for the very same reason humorist Dave Barry’s email is unlisted ~ he could never read them all); so all correspondence was by snail-mail. His modus operandi was, if you please, akin to that of running a ‘Mom and Pop’ grocery store...without the Mom. He assembled material in assorted piles, topically, until there was a sufficient amount of significantly useful information for an issue; he collated, scanned, typed, edited (where necessary), reproduced, laid out and proofed a camera-ready copy that he sent to the printer in Pittsfield, Mass. When it was ready, he traveled the 380-mile round-trip to retrieve it; he hand-wrote the address labels, adding a personal note to some ~ not all ~ copies of the issue and stuffed and sealed the envelopes. He sorted them by ZIP code and bundled them in accordance with the mandates of the U.S. Postal Service Guide for bulk mailers ~ as many as 300 bags or more. Finally, he trucked all the bags to the local bulk mail facility, where they were weighed and paid for out of his USPS account. Tom said the cycle from receipt of TSPE to delivery to the post office consumed at least one week. That, readers, was Tom Dunn, a modern man of modern means who was really an old-fashioned, free-spirited ~ but very focused ~ hands-on, do-it-yourself guy. Next year, 2006, marks the 42nd Anniversary of THE UNIVERSAL COTERIE OF PIPE SMOKERS (TUCOPS). It will also mark the cessation of both the Coterie and its journal, The Pipe Smoker's Ephemeris (TPSE). Effective immediately, we are no longer accepting new members into the Coterie and are not accepting any submissions for publication. However, we do plan to organize and publish as much of the voluminous backlog of material that we already have on hand, as possible. As some Coterians already know, your Editor was diagnosed with cancer in November 2004. Major surgery in January 2005 failed to cure the condition, but subsequently – after an aggressive 3 mos. regimen of chemotherapy – the cancer was brought under control. Now three months later, the cancer shows signs of renewed growth, necessitating further chemotherapy. One of the side effects of this treatment is our reduced energy level, which has prompted the above decision. In 2006, we hope to complete and publish one or two more issues of the Ephemeris. We also then hope to be able to advise you of the disposition of the Coterie's archives and collections. Meanwhile we are seizing this opportunity to enclose – quite prematurely – our 2005 Santa-with-Pipe holiday greeting postcard – the last of this series – and to extend our sincere thanks for all your support and contributions over all these years. Pipes & Tobacco Magazine featured him on the cover of its Spring 2006 issue, with the tribute by Rapaport gracing its pages. In the only other form of tribute authorized by the family of the man who prized his privacy and would never accept honors, the Chicagoland International Pipe & Tobacciana Show in May 2006 was dedicated to his memory. There, show patrons saw a table exhibit containing photographs, personal items that had belonged to him, and information about him. Visitors signed a dedication book and wrote short notes, the book to be presented to the family. A friend of Tom’s gave a short talk about his life at the Friday evening Welcome Dinner. Pipes and paraphernalia from his collection were sold at auction and on Ebay. As he had been an avid collector and international correspondent regarding all things tobacciana, his extensive library was donated to the University of Alabama. I had so badly wanted to meet Tom, a feeling that felt shared with half the population of the planet. I told him that in a letter before he died. Having received his last letter, I wrote to tell him how I regretted never having met him, but to thank him ever so much for all he had done for me, and to tell him how very much I had enjoyed the Ephemeris and his friendship. At the close of my 2005 Christmas letter ~ a letter he never lived to receive ~ I told him that my wife and I were praying for him. Afterwards, I found out from a niece that he had died. “The pipe-world has lost one of its greatest men,” noted RÖKRINGAR (Smoke Rings), published by the Pipe Club of Sweden. 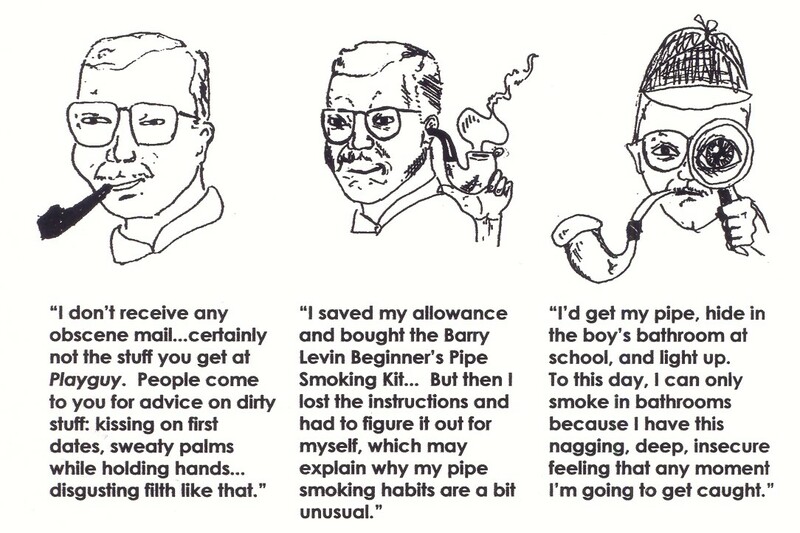 B&W illustrations are from the pages of The Pipe Smoker’s Ephemeris. Sketches of Tom Dunn at the head of this page were drawn by Brian Zecher. 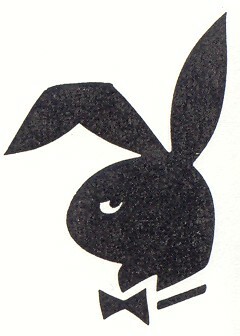 Illustration of the Playguy Bunny was drawn by the author.